Welcoming the Minister and other distinguished guests Mr. Ravindra Sannareddy, Founder Managing Director, Sri City traced the growth of the business city and thanked the state government for the support and encouragement being extended. “I thank the Hon’ble Minister and other officials for preferring Sri City as the venue for the seminar. I am sure, the conclave will provide a great opportunity for all the stakeholders to share and exchange ideas and interact with each other,” he added. Addressing the gathering Mr. Talari Aditya, Member of Legislative Assembly, Satyavedu said that because of its excellent performance, Sri City enjoys a preferential treatment from government. “Because of Sri City, Satyavedu came into limelight. I feel proud that it is in my constituency,” he said. Emphasising the importance of safety, Mr. G. Balakishore, Director of Factories, Andhra Pradesh said, an industry can not progress with mere productivity. Safety and welfare of staff play important role in its success. 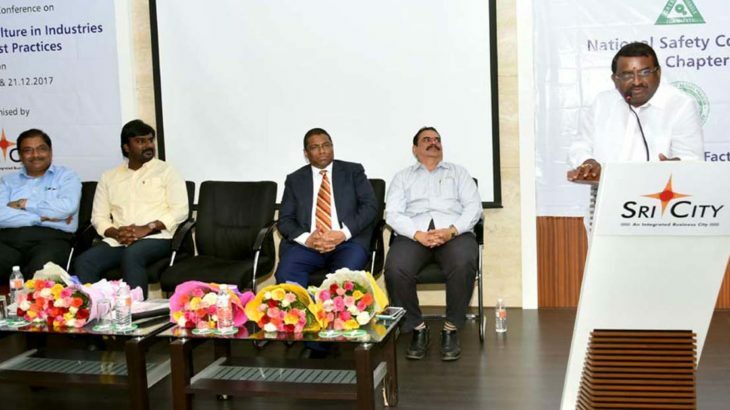 The two-day conference was jointly organised by the Factories Inspectorate and management of Sri City, involving all the stakeholders, including the State Government departments of Factories and Labour Welfare and the industries in the region. The intent was to discuss and deliberate on building safety culture In industries and sharing the best practices. Besides the HR and safety managers of Sri City units, a large number of safety officers of various factories in Chittoor & Nellore districts have attend the conclave.